Top row (left to right): 1. Mr Harry C. Balek (Principal), 2. Mr Warren Woodworth, 3. Miss Gail Dahlin, 4. unidentified, 5. Shelly Desdier, 6. unidentified, 7. unidentified, 8. unidentified. Second row: 1. unidentified, 2. Mitzi Hackenburg [sp? ], 3. no picture, 4. no picture, 5. no picture, 6. no picture, 7. unidentified, 8. Kathy Kelly. Third row: 1. Diane Ball, 2. Mike ?, 3. Margaret ?, 4. Mike, 5. Carol Duncan, 6. Doug Woods, 7. Cathy Johnson, 8. Bruce ?. Fourth row: 1. unidentified, 2. unidentified, 3. Tim?, 4. unidentified, 5. Brian McFann, 6. unidentified, 7. no picture, 8. unidentified. Fifth row: 1. Judi Green, 2. Donald Ackley, 3. Nancy Elsperman, 4. Greg, 5. Tina Darmohray, 6. Matt Csicsery, 7. Roberta Thompson, 8. unidentified. Credits: Thanks to Donald Ackley, Tina Martin Mackey, Doug Woods, Brian McSharry, Judith (Green) Schreiber, Shelly Desdier, Tina Darmohray, Carol (Duncan) Sjoberg, Larry Ball, and Pam Landram for identifying the kids in this picture. Miss Dahlin changed her name to Mrs Dryden part way through the year. 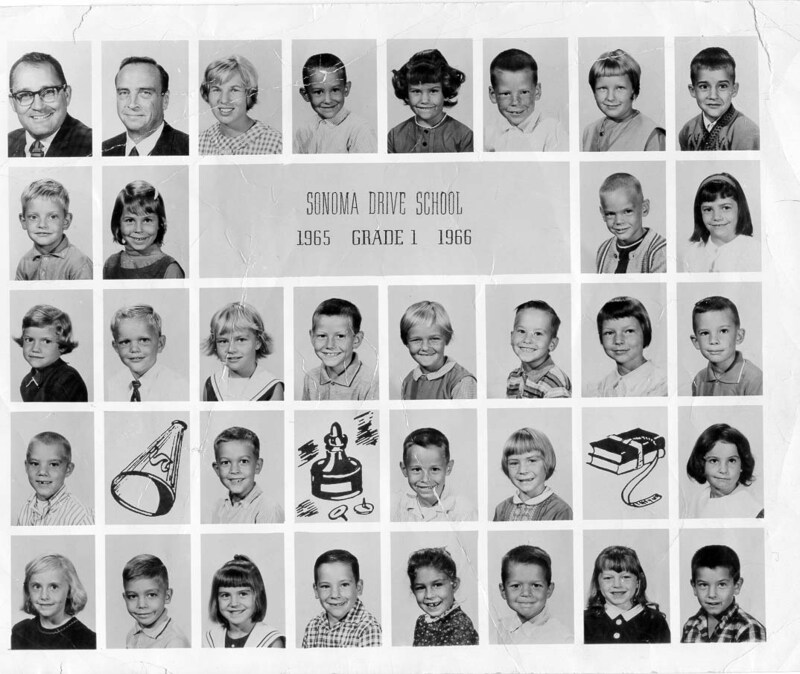 To find other pictures from Sonoma Drive School in the archive, see Livermore class pictures listed by school: Sonoma Drive School. And if you have any pictures from Sonoma that you would like to share, please submit them to the Archive.